Charles Dixon RI (1872-1934). Grisaille and watercolour vignettes: signed, or initialled CD, and dated 1920. Provenance: NR Omell, "Marine Paintings of the 18th, 19th and 20th Centuries, 1986. item no.35. Price £3250". Painted by Dixon almost certainly for the Graphic magazine (pictorial records show similar watercolours en grisaille of 1920 Clyde Fortnight regattas executed by him for the Graphic of 10 July 1920), Clyde Fortnight was the place to be at this stage of the Summer Season in the 1920s and 30s. Cowes Week, based around the Royal Yacht Squadron, followed in early August and then it was back up north again for the grouse moors! The Firth of Clyde is one of the finest stretches of water anywhere in the world for tactical yacht racing as it contains a network of sea lochs and islands against a mixed backdrop of hills and coastal towns. Although its relatively sheltered the Firth has to be treated with considerable respect as the hills cause plenty of wind shifts and squalls, whilst the tide and local currents create interesting, challenging sea conditions and have been responsible for many a race being won or lost. The Royal Yacht VICTORIA & ALBERT, prominently featured in the left hand and central vignettes, was there to support His Majesty and small Household in Waiting and to set the style on the two weeks of regattas, and the Commander-in-Chief Atlantic Fleet (Admiral Sir Charles Madden Bart GCB GCVO KCMG) flying his flag in the battleship HMS QUEEN ELIZABETH (Captain The Hon Matthew Best DSO* CVO RN) had brought along with him one of his Battle Squadrons, the 5th, HM Ships BARHAM (Captain RC Dalglish RN), MALAYA (Captain Percy Royds CMG RN), VALIANT (Captain Cecil Staveley CMG RN) and WARSPITE (Captain Francis Clifton-Brown CB CMG RN). 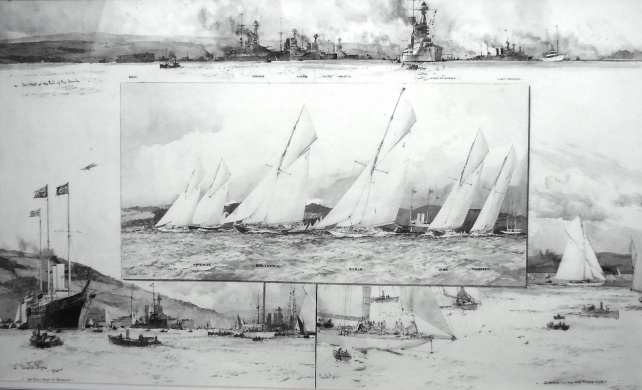 There were flotillas of escorting cruisers and destroyers there too, and one of the world's first aircraft carriers, HMS ARGUS (Captain Humphrey Hugh Smith DSO RN), all faithfully shown here by Dixon; and in his own hand across the top of the painting is inscribed "The Fleet at the Tail of the Bank". In 1919 King George V ordered that his racing cutter BRITANNIA be fully fitted out for the 1920 season and entered in Royal regattas: this gesture of His Majesty was seized upon enthusiastically by the yachting community and more than a dozen yacht owners ordered new boats or their old ones to be refitted. 1920 marked the post war revival of Clyde Fortnight and we read that a huge effort was put into ensuring that it was a success: there were many pre-war crews with sad gaps in their numbers and of course the boats, too, had not prospered during the 4 years of war. The events were indeed given a big boost by the decision of the King to attend many of the races in person aboard his beloved BRITANNIA who Sir Philip Hunloke, the King's Racing Master, had meticulously prepared for this first post war sailing season, and this much admired and highly succesful boat was to win several of the races that year. Featuring in 2 out of the 4 vignettes is HMY VICTORIA & ALBERT and the King and Princess Mary boarded her on 11th July from Edinburgh. The King was soon sailing in BRITANNIA but made time too to receive onboard the Royal Yacht the Flag Oficers and Secretaries of the yacht clubs that had worked so hard to pull the fortnight together. Out on the water the competition was fierce and Dixon shows us several of the King's competitors: ZINITA, HARBINGER, NYRIA, VIDA, MOONBEAM; and the vignette at bottom right is entitled, also in Dixon's hand, "ZINITA wins the King's Cup". The watercolour's frame bears a gilt plaque on its bottom edge: "The Regatta at Rothesay C Dixon, R.I. 1920".